APPSC has published the Deputy Surveyors Recruitment 2019 notification and applications are invited online from qualified candidates to the post of Deputy surveyor in a.p. survey & land records subordinate service in the State of Andhra Pradesh. The proforma Application will be available on Commission’s Website (www.psc.ap.gov.in) from 20/02/2019 to 13/03/2019 is the last date for payment of fee up- to 11:59 mid night). 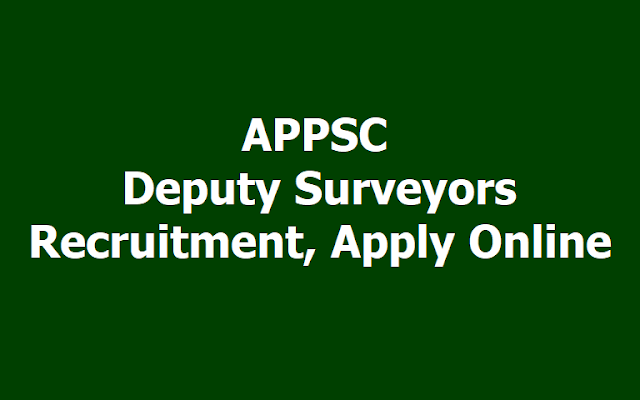 Deputy Surveyor in A.P. Survey & Land Records Subordinate Service (General Recruitment). ఆంధ్ర‌ప్ర‌దేశ్ సర్వే అండ్‌ ల్యాండ్‌ రికార్డ్స్‌ విభాగంలో కింది ఉద్యోగాల భర్తీకి ఆంధ్ర‌ప్ర‌దేశ్ ప‌బ్లిక్ స‌ర్వీస్ క‌మిష‌న్ (ఏపీపీఎస్సీ) ద‌ర‌ఖాస్తులు కోరుతోంది. అర్హ‌త‌: ఎస్సెస్సీ, నేష‌న‌ల్ కౌన్సిల్ ఆఫ్ ఒకేష‌న‌ల్ ట్రెయినింగ్ స‌ర్టిఫికెట్ ఇన్ డ్రాఫ్ట్స్‌మ‌న్‌(సివిల్‌) లేదా ఇంట‌ర్ ఒకేష‌న‌ల్‌(క‌స్ట్ర‌క్ష‌న్‌) ఉత్తీర్ణ‌త‌. వ‌య‌సు: 18 నుంచి 42 ఏళ్ల మ‌ధ్య ఉండాలి. ఎంపిక‌: ప్రాథ‌మిక‌, ప్ర‌ధాన‌, వైద్య ప‌రీక్ష‌ల ఆధారంగా. i) Must have passed Secondary School Certificate Examination conducted by Board of Secondary Education, Andhra Pradesh, Hyderabad OR its equivalent examination as prescribed from time to time in sub-rule (2) of Rule 12 of Andhra Pradesh State and Subordinate Service Rules, 1996. Must have passed either ITI (Civil Draughtsman) (Note: Intermediate Vocational (Construction Technology) with Four (4) months practical training is deleted vide G.O.Ms.No.546, Dt.21-10-2013). Age limit: Candidates age limit should have minimum 18 years and maximum 42 years. Selection procedure: Appointment to the posts will be made by examination (objective type) by Online/ OMR based. In case screening test is conducted as referred above, based on the Merit in screening test, candidates will be picked up in the ratio of 50 per one notified post for the main examination in order of General Merit. In case where no screening test is held, all the eligible applicants would be allowed to appear for the main examination. The final selection of candidates for appointment to the posts shall be based on the merit in the computer based main Examination, to be held as per the scheme of examination enunciated at para 7 in notification. Application fee and Exam fee: Applicant must pay Rs. 250/- (Rupees Two Hundred and Fifty Only) towards application processing fee and Rs 80/- (Rupees Eighty only) towards Examination Fee. Mode of Payment of Fee: The Fee mentioned in the above paragraph is to be paid through Payment Gateway or Net Banking/ Credit card /Debit Card. The list of Banks providing service for the purpose of online remittance of Fee will be appended separately. Before applying for the post, an applicant shall register his/her bio-data particulars through One Time Profile Registration (OTPR) on the Commission Website viz., www.psc.ap.gov.in. Once applicant registers his/her particulars, a User ID is generated and sent to his/her registered mobile number and email ID. Applicants need to apply for the post using the OTPR User ID through Commission’s website. Notification specific details such as Examination City opted, eligibility and accepting declarations etc. are to be filled by the applicant. (Preview and Edit facility is available to make changes) and SUBMIT the application form. An Application Fee ID is generated and sent through the SMS/email after successful submission of application form, which is to be used for payment of Fee. The Commission conducts Screening test in Off - Line mode in case applicants exceed 25,000 in number and main examination in On-Line mode for candidates selected in screening test. If the screening test is to be held, the date of screening test will be communicated through Commission’s Website. The Main Examination is likely to be held On-Line through computer based test There would be objective type questions which are to be answered on computer system. HALL TICKETS: Hall tickets can be downloaded 7 days before commencement of Examination. Submission of Online application: 20/02/2019. Last date for submission of Online application: 13/03/2019.